One week ago something monumental happened in the fashion world that you may not be aware of! 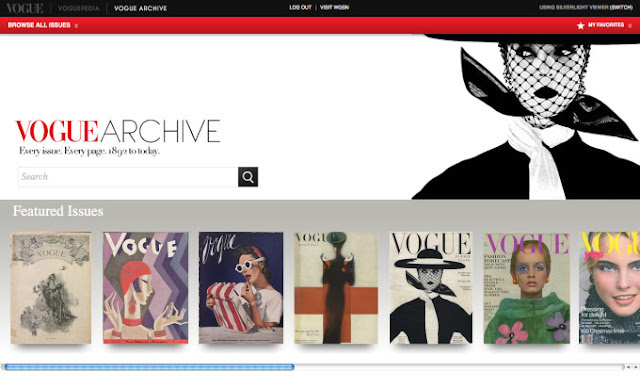 Vogue Magazine digitized the entirety of its archives dating back to 1892. The archive is a living, growing database that includes every American issue EVER published by the magazine--every page, every cover, every article! Individual subscriptions to the archive are now offered for an insane price of $1,575 a year. I know Vogue is theeee fashion equivalent of the bible, but that's still an insane amount of money just to read a magazine. So I'm excited to share a big money saving secret: The New York Public Library just purchased a subscription to Vogue's Archive. This means the public (that means you) can access it for FREE on any of the library's computers throughout Manhattan, Staten Island and the Bronx (Queens and Brooklyn are not NYPL). Perfect for Bon Vivant + a Budget readers who live in and around NYC! You asked me about the blouse I wore yesterday on my blog. And yes, it is a Gap "Tall". WOW! That's amazing!!! I'm bookmarking this page and sharing it right now! Your screen grab is from the interface offered through WGSN. The Library product is different. The Libraries are using the standard Proquest interface, which only shows article results, and no image search results. I've seen both versions and there's a huge difference. Re: "Your screen grab is from the interface offered through WGSN. The Library product is different. The Libraries are using the standard Proquest interface, which only shows article results, and no image search results. I've seen both versions and there's a huge difference."